Beautiful, Relaxing Florida Keys - The Perfect Escape to Paradise. A 3/2 Home, Clean, Bright and Refreshing Décor with Comforting Bamboo Floors and a Open Floor Plan. Bedding for up to 7 guess. Has Davits, 40' Foot Dock, The Pool is our Canal where everyone Swims Year Round, Also Only Canal with Lighted entrance markers for safe navigation. 2 Minutes to the Open Ocean and full throttle on your boat. Near Tavernier Creek for easy passage to the Gulf Side. You'll Also Find Popular Harry Harris Park Within Walking Distance which has, Boat Ramps, Fishing, Swimming Basin, Children's Playground, Picnic Areas with Charcoal Grills, Softball Field and Basketball Courts. Beach Area. World Famous John Penny Camp Coral Reef State Park is Just North on Us-1 with Some of the Best Snorkeling and Diving in the Keys. There Are Numerous Diving Centers and Shops Offering Diving, Snorkeling, and Kayaking Excursions, Boat Rentals. Deep Sea Fishing Charters All Within a 5 Minute Drive. Efficiency Central A/C - Heater, Outside Gas Grill, Plenty of Out Side Storage, Private Parking. Counter Top Electric Toaster Oven, Garbage Disposal. Out Doors: Gas Barbecue, Two Bicycles, Fish Cutting Table , Bait and Fish Freezer, Dock Ladder to Enter and Exist from Your Swim in the Crystal Clean Water. Relaxing Landscaping Coconut Trees, Arecas palms,Traveling Palms, Colorful Bougainvillea, Fish Tail Palms, Fragrance Flowering Frangipanis. You'll Love the Out Door Setting and feel relaxed . Call Now for Availability! Hi, My wife and I are professional Martial Artist for 35 year. Our business is in Weston (Fort Lauderdale),Florida. We enjoy kicking around and everything that has to do with the ocean. Hi There, Thank you for visiting my listing and I wish you a great vacation. I have been visiting the Florida key’s since 1965 and I still count the days looking forward to the weekends and holidays to relax and enjoy the magic of our home in the keys. If you allow me to host your next vacation stay. you’ll quickly see why I chose to buy my home in the subdivision of Blue Waters in Tavernier. My wife and I enjoy the convenience of the best stores, shops and , restaurants. But best of all we feel the waters in this area are superior. First if you like deep sea fishing the gulf stream tends to flow in closer to land in our area. There are many benefits to this. Also the Diving and snorkeling is unmatched with John penny camp national preserve , and our life filled reefs. Now, here is the something even more unique , Tavernier key is about 200 yards from shoreline that offers shallow sandy bottom for swimming and beach area. The islands is often the a final destination after a day fishing to anchor, barbeque, sip a refreshment, swim, kick back and love life. This island also protects the shore and offer calmer waters for skiing , tubing, jet skiing, flat fishing, bait catching. These are just some of the many highlight you will definitely enjoy. I guarantee you will have made the perfect choice allowing me to be your host. outdoor shower, Shower dock side. Canal view, easy access and safe access for boats. Deep water Canal, Clean and refreshing for swimming. Parking can accommodate three Cars or a Boat trailer ( tandem) and two cars. Frogg's gym on US1 - running distance away. not a senior Adult community however senior are always welcomed. Our pool is the our canal. Everyone swims in the canal. You'll find noodles and floating devices in the home or head to Harry Harris Park Just a short walk or bike ride away and swim in the beach. We had a wonderful time at the house. The location is perfect for boating, and the fish cleaning station and freezer at the dock are delightful to have. We really enjoyed the wrap-around porch and spacious living room sofa. The owner was responsive, friendly, and easy to communicate with. We would definitely recommend the house, especially for easy boat access to the Atlantic, back country, and Gulf. The reason for 4 stars instead of 5 is the bathrooms could use an update, though they are certainly adequate. And while we enjoyed the wrap-around porch, it would have been nice if it were screened in to reduce insect bites. It wasn’t totally clear from the pictures that it’s a modular home, which is a common style in the area (not an issue, just a bit of a surprise). Again, we had a great time and would absolutely recommend the house for people looking for a fun waterfront getaway in Tavernier. EXCELLENT PLACE ESPECIALLY FOR THOSE WHO WANT QUICK OCEAN ACCESS WITH THERE BOAT. THE DOCKAGE AT THE CANAL IS NICE AND CANAL IS WIDE ENOUGH FOR BOAT TO MANEUVER THROUGH. SET UP WELL FOR THOSE WHO LIKE TO FISH AND DIVE. HEAD STRAIGHT OUT OR SLIGHTLY SOUTH OR NORTH TO BE ON GREAT REEFS. 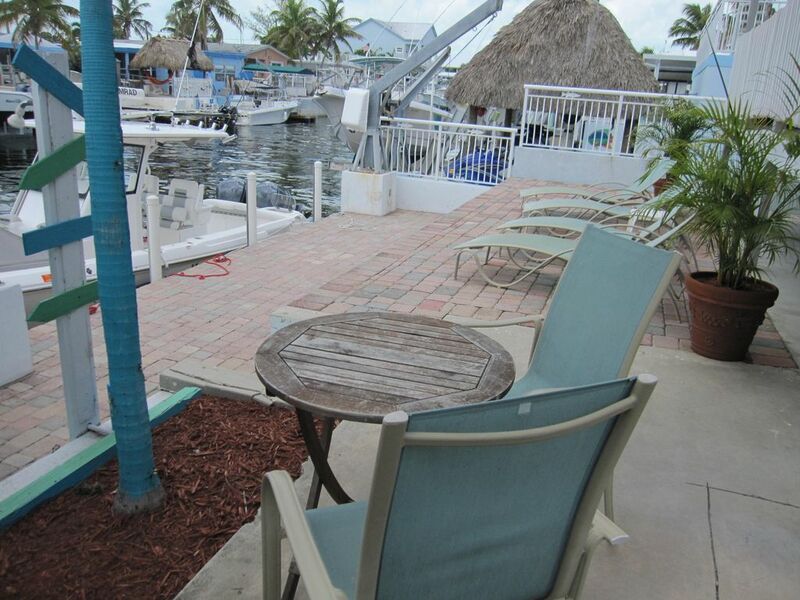 HAS EASY ACCESS TO BOTH KEY LARGO AND TAVERNIER. PLACE HAS EVERYTHING YOU NEED IS CLEAN, COMFORTABLE AND SERVES ITS PURPOSE. BEDS SLEEP WELL, AIR WORKS GREAT AND WAS QUIET INSIDE THE HOUSE. NOT A FANCY PLACE BUT I REALLY ENJOYED IT!! My sisters and I shared the home in March and April 2015 - was a great home with excellent location and great amenities; it was clean and well equipped. Dock was well kept and the fishing was very good. Canal was clean and full of juvenile tarpon. Thoroughly enjoyed our stay and found Gus easy to deal with. My husband and I, and my sister and a friend, stayed here for the month of January. We enjoyed it very much. The kitchen is well appointed with everything we needed to cook. The new couch in the living room was wonderful and comfortably seated all of us. The ability to use Netflix for movies and the great WIFI access was an added bonus. The location was great; between Key Largo and Islamorada, and a short walk to a small park that has a protected beach. There was a Winn Dixie less than 2 miles away. The house was easy to get around for my husband who uses a cane and my sister who was recovering from a broken foot. Gus was great to deal with. This truly feels like home only better cause it's in the Keys! Everything you need is provided & the location is great. Gus & Carmen have been updating/upgrading the entire property over the past several years, making everything quite comfortable & relaxing, and the property is very clean....no bugs! You won't be disappointed if you choose to stay here; we'll be back again next year. We (me, my husband, and our 3 kids) spent Thanksgiving at this wonderful house. We had a great time! The kitchen was great and we really enjoyed creating our untraditional Thanksgiving feast with what was on hand (which was quite a bit)! Would recommend this place to anyone. Thanks so much, Gus! Send request for the an exact price quote including local and state taxes plus cleaning fee.